Weather Report and exhibit curated by Lucy Lippard at the Boulder Museum of Contemporary Art, September - December 2007. "Xavier Cortada created a series of extensive installations on his Antarctic visit, focusing on the crucial element of time. The Florida native cast an ice replica of a Mangrove seedling that is very slowly making its way over 150,000 years to the coastline. 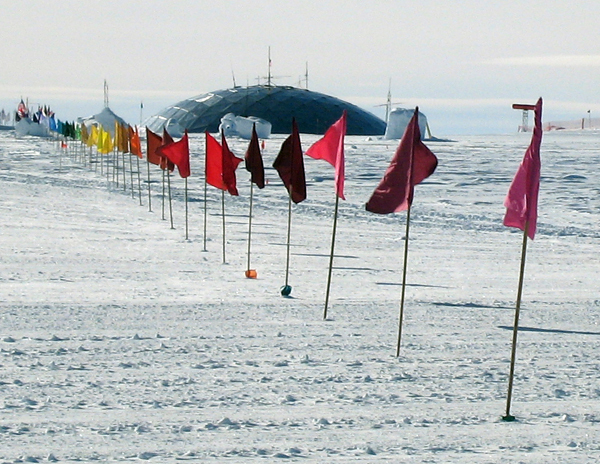 In contrast, he marked the mere 50-year history of human presence at the South Pole with chronological flags stretching across the frozen land." Weather Report exhibition catalog, Boulder Museum of Contemporary Art, 2007. SEPTEMBER 14 - DECEMBER 21, 2007 -- "Weather Report: Art and Climate Change" is an exhibition curated by internationally renowned critic, art historian, and writer Lucy R. Lippard. It is presented in collaboration with EcoArts. This exhibit partners the art and scientific communities to create a visual dialogue surrounding climate change. Historically, visual arts play a central role in attracting, inspiring, educating and motivating audiences. 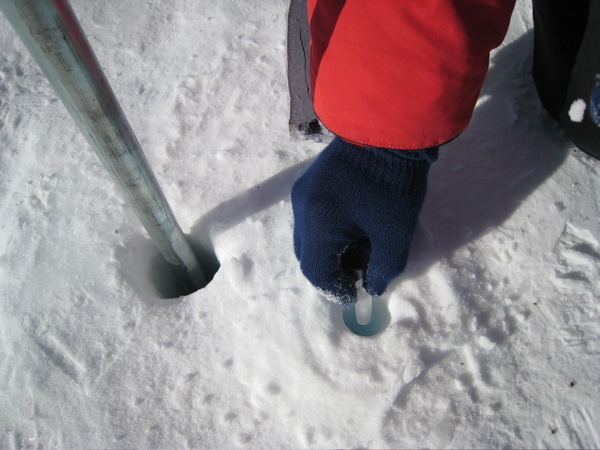 "Weather Report: Art and Climate Change" will exhibit artwork, in the museum and our partnering venues, and in outdoor site specific locations throughout Boulder, that will activate personal and public change. Our collaborating partner EcoArts is a new effort bringing together scientists, environmentalists, and performing and visual artists - along with producers, presenters, scholars, spiritual leaders, policy makers, educators, businesses, and people from all walks of life - to use the arts to inspire new awareness of, discussion about, and action on environmental issues, with new possibilities for envisioning a sustainable future. Its programming principles are artistic excellence, scientific accuracy, environmental effectiveness, ethical practice, and whenever possible, presenting activities that strive to follow "the middle way" of being either non-partisan or bi-partisan to reach the widest audience possible. Exhibiting partners: ATLAS (Alliance for Technology, Learning and Society) Center at the University of Colorado, Boulder; Boulder Public Library; National Center for Atmospheric Research (NCAR); City of Boulder; University of Colorado, Fiske Planetarium; University of Colorado, Norlin Library Galleries. Kim Abeles, Lillian Ball, Subhankar Banerjee, Iain Baxter, Bobbe Besold, CLUI (Center for Land Use Interpretation; Matthew Coolidge), Brian Collier, Xavier Cortada, Gayle Crites, Agnes Denes, Rebecca DiDomenico, Futurefarmers - Amy Franceschini + Michael Swaine, Bill Gilbert, Isabella Gonzales, Newton and Helen Harrison, Judit Hersko, Lynne Hull, Basia Irland, Patricia Johanson, Chris Jordan, Marguerite Kahrl, Janet Koenig and Greg Sholette, Eve Andre Laramee, Learning Site, Ellen Levy, Jane McMahan, Mary Miss, Joan Myers, Beverly Naidus, Chrissie Orr, Andrea Polli, Marjetica Potrc, Aviva Rahmani, Buster Simpson, Kristine Smock, Joel Sternfeld, Mierle Laderman Ukeles, Ruth Wallen, Melanie Walker and George Peters, Sherry Wiggins, and the Yes Men. This exhibit is funded in part by The Andy Warhol Foundation for the Visual Arts, The Boulder Arts Commission, the Scientific and Cultural District Fund, EcoArts, and the Compton Foundation. 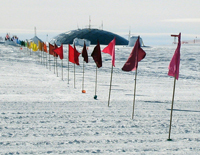 Xavier Cortada, The Markers, 2007 (The South Pole). Xavier Cortada's work has been shown across four continents and is in the permanent collection of The World Bank. The Miami artist has been commissioned to create art for governmental (the White House, Florida Supreme Court, Miami City Hall) and cultural institutions (Miami Art Museum, Museum of Florida History). Major collaborative art projects include International AIDS murals in Switzerland and South Africa, peace murals in Northern Ireland and Cyprus and child welfare murals in Bolivia and Panama. Copyright © 1997-2006 by Xavier Cortada. All rights reserved.